Whether chocolate is dairy-free or not depends on the type of chocolate you are buying. While some types are dairy-free, others obviously have dairy, while dairy-derived ingredients may be lurking in other types. Milk chocolate is not dairy-free, as it contains milk and usually other dairy ingredients as well. If you must avoid milk due to an allergy, lactose intolerance, or as part of a vegan or paleo lifestyle, you will need to eliminate milk chocolate. High-quality dark chocolates are the best places to look to satisfy your dairy-free chocolate cravings, as they should only contain cocoa butter, cocoa liquor, lecithin (usually soy-based), and sugar. Not all dark chocolate bars are equal, however, and many commercially-produced chocolates contain a long laundry list of dairy-derived ingredients, so label reading is essential. Look out for whey, casein, and anything with the word milk. Look for dark chocolate bars and other dark chocolate products that have a short list of ingredients. A longer list often signals that they are using fillers, some of which may be dairy-derived. A high percentage of cacao, between 55 and 85 percent, signals that it is a high-quality bar. It is always safest to look for chocolate that is specifically labeled dairy-free or vegan. You can find dairy-free baking chocolate, including chocolate chips. While dark chocolate is considered to have more of a bitter flavor compared to milk chocolate, it's still a great dessert. It might not satiate a sweet tooth the way milk chocolate will, but it's still a lovely decadent flavor. It pairs well with many fruits and other flavors and is truly a versatile dessert. While dark chocolate may be full of sugar and should be consumed in moderation, it's a good option for those times when you want something sweet. Dark chocolate isn't just great for those who can't consume milk, it's a delicious treat with many health benefits. It's packed full of antioxidants and nutrients like zinc, magnesium, copper, and even potassium. Dark chocolate has actually been shown to have more antioxidants than some berries. Many dark chocolates also contain caffeine which can put an extra pep in your step. Researchers are quick to grab headlines about the health benefits of chocolate. Keep in mind that sometimes the studies are small and the results may be misinterpreted by the press. As well, negative or contradictory results rarely receive the same amount of press. This said, there have been studies showing that consuming small amounts of dark chocolate can help improve your blood flow and overall cardiovascular health. The flavonoids in chocolate may help in lowering LDL or "bad" cholesterol levels that can promote dangerous plaque formation on your artery walls. Unfortunately, most commercially-produced chocolate is highly processed, which can remove some of these beneficial flavonoid antioxidants. Chocolate: Pros and Cons of This Sweet Treat. Harvard Health Publishing. https://www.health.harvard.edu/heart-health/chocolate-pros-and-cons-of-this-sweet-treat. Heart Healthy Benefits of Chocolate. Cleveland Clinic. 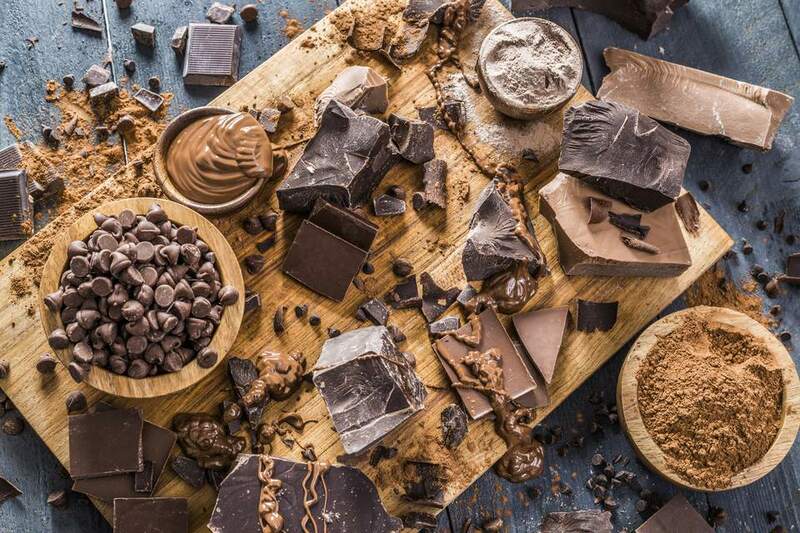 https://my.clevelandclinic.org/health/articles/16774-heart-healthy-benefits-of-chocolate.